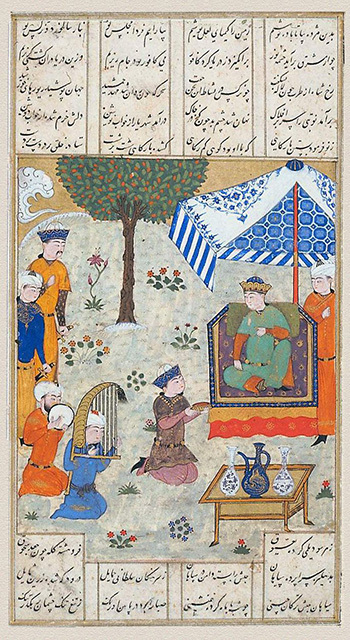 The Khamsa (Quintet) of Nizami or "The Five Tales" by the 12th-century poet Nizami is considered one of the greatest works of Persian literature. Nizami Ganjavi (whose real name was Ilyas Abu Muhammad Nizam al-Din of Ganja, Azerbaijan; c.1141-1209 or 1217), in this work, set new standards for elegance of expression, richness of characterization, and narrative sophistication. The Khamsa consists of the following five romantic poems (loosely translated): Treasury of Mysteries, Khusraw and Shirin, Leili and Medjnun, Seven Beauties, and Iskander-nameh. The single page at the left comes from the second poem and shows the emperor Khusraw organizing a royal reception (hover over image to enlarge; image © 1998 Museum of Fine Arts, Boston, museum object #60.176, and obtained through the Art Museum Image Consortium (AMICO) by the Dalton School, NYC). The manuscript page becomes an interactive virtual world and linked objects in the scene are themselves zoomable and rotatable virtual worlds. Experience the new interactive Khamsa module here.